We introduced a new section at Project Management Zone which presents statistical distributions of various characteristics of project management systems. In the last years, we have collected properties of over 280 project management systems in three categories. Our new section shows some statistics based on these data. For example, let's have a look at the type of licenses these systems are using. 80% of all project management systems come as web-based service, or at least offer the option to use their software as cloud solution. 38% use a commercial license and 18% are open source systems. The sum of these options is more than 100% because systems often offer more than one type of license. If we make the same statistic weighted by their popularity, rather than based on the number of systems, these figures change significantly. Web-based services now account for 97% of the total popularity, commercial licenses more than double to 78% whereas open source systems fall back to 2%. That means that popular systems are either web-based or commercial systems, many come in both forms. These figures also depend on the category of the systems. The diagram above shows the overall figures. If we dig a bit deeper, we see that the percentage of web-based systems rises to 86% for project collaboration tools. The corresponding percentage for project planning tools is 82% and only 79% for issue management tools. Open source systems are strongest in the issue management category with 26%. The programming languages, in which the systems were written, are not always known for purely web-based systems. They are not very relevant in those cases anyway. The majority of the other systems are written in Java (39%), closely followed by PHP (34%), and a bit further behind Ruby (10%), Python (6%) and C++ (3%). C# is not used by a lot of systems, but by very popular ones, particularly SharePoint, therefore it is the leading language according to the popularity distribution. PHP is the most used language among issue management and collaboration systems, but the combined share when measued by popularity is below 1% in all categories. The distribution based on the supported operating systems is dominated by Windows (84%), but Linux (69%) is not very far behind. OS X comes to 48%, while none of the other operating systems reaches more than 13%. The distribution as measured by popularity is completely dominated by Windows, based on the very strong Microsoft systems SharePoint and MS Project. 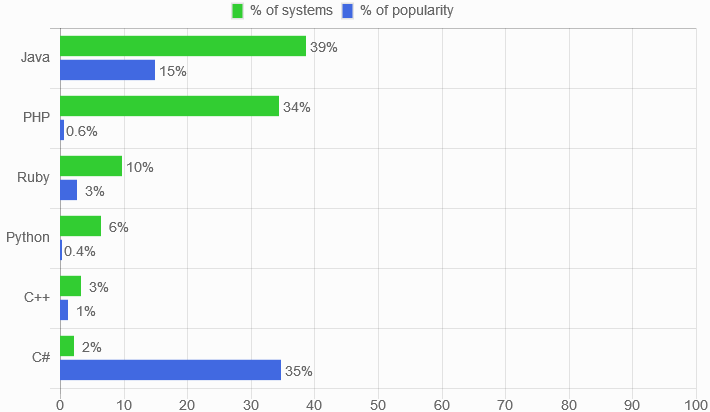 Broken down by system categories, Linux is actually on par with Windows among collaboration tools. iOS is the leading mobile platform for project management systems, supported by 42% of all systems. Android is not far behind with 38%. Windows Phone and Blackberry are supported by only 4% of all systems. Weighted by popularity, iOS and Android are head-to-head with 66%, and Windows Phone is doing quite well with 38%, again due to the popular Microsoft systems. We also provide statistics on authentication mechanisms. No big surprises here, but an interesting subset are single-sign-on identity providers: Google is supported by 28% of the systems, followed by Facebook (11%), LinkedIn (5%), Twitter (4%), GitHub (3%), Microsoft (3%) and Yahoo (2%). Finally, we have statistics on notification methods, where the vast majority of system providers still expect you the check your emails regularly. We will continue to monitor those statistics to see how they change over time, and we will dicuss notable developments in this blog.